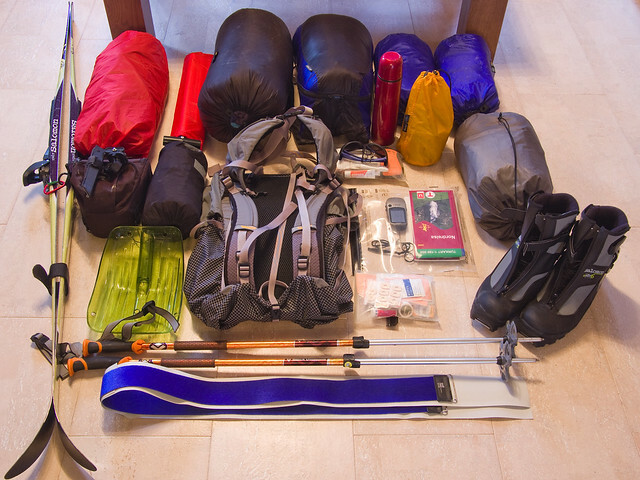 All gear and food (except from worn clothing) packed for the two week winter ski trip through northern Scandinavia. 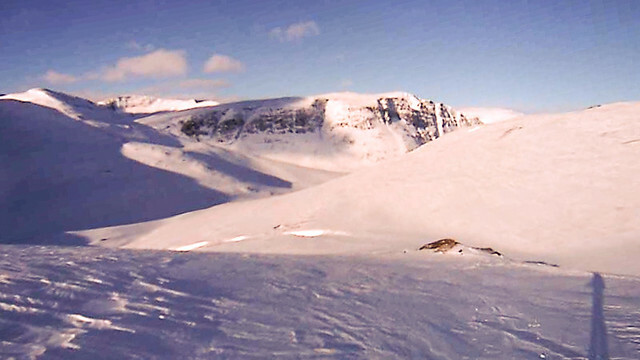 The most beautiful winter ski trip I’ve ever done so far was skiing from Tromso to Kautokeino in Northern Norway during March 2011, even though this trip didn’t went as I had planned beforehand. First of all my photo camera broke during the first day. All I had left to catch some visual memories was the horrible 1,3 megapixel built-in camera of my cell phone and a rather cheap fish-eye video camera, similar like a Gopro camera but with less quality. The video above was shot with this fish-eye camera and all the photos below are either shot with my cell phone or are defished snapshots from the video footages I took with the video camera. Then secondly, I had to cope with quite some gear failures during the second part of the trip that forced me to leave the initial plan which was skiing from the surroundings of the Reisa river near the Finnish border passed halfway the trip, to Alta at the coast by making a traverse over the vast Finnmarksvidda plateau. Instead I chose to deviate to Kautokeino which was closer by even though I didn’t had a map with me of the route towards this Sami village! You see, this was a trip with quite some unforeseen circumstances. So lets go on to the trip report. Looking back through Tromsdalen towards Tromso at the coast. Tromso, the Paris of the North as the city is also called or lets better say the Paris under a bunch of snow. The people didn’t seem to know where to go with all the snow in their yards. 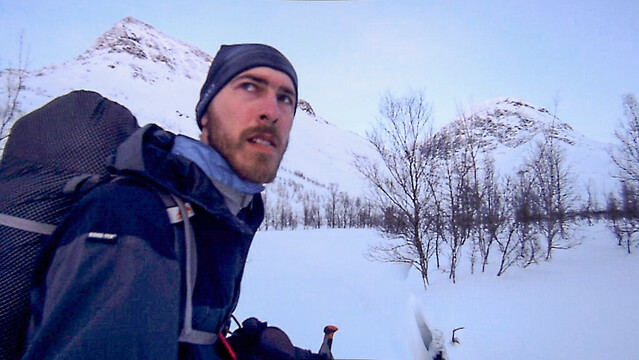 After buying a few gas canisters and visiting the postal office to send a supply package ahead to Lyngseidet, I left the city on my skis and pinnacle on my back. I met some cross country skiers on the groomed track in Tromsdalen. 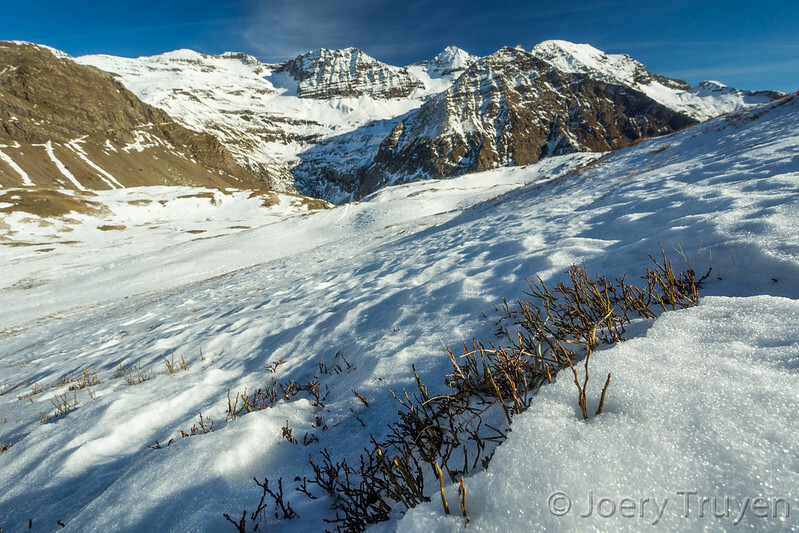 Once in the head of the valley under the north face of Tromstinden, I left the track and climbed over the unbeaten snow to the heights above the slope of the valley. The weather was deteriorating and the first gear failure of the trip became a fact. My photo camera didn’t want to turn on again, no matter what I tried. I was angry since the pictures I take during my trips are for me the most valuable memories. Somewhere between Skarvassbu and Nonsbu with temporary improved visibility. It didn’t take long before it started to snow and a few moments later I got lost in a white out, fog, strong winds and horizontal snowfall. It got difficult to keep on track. 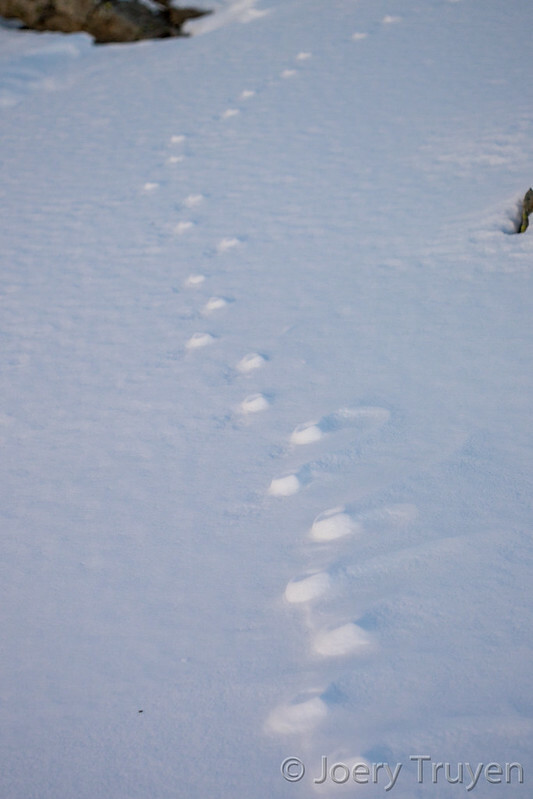 Small birch sticks were put in the snow to mark the winter trail to the Skarvassbu mountain lodge but the sticks were put too far away from each other so that it became impossible to find the next one in the white out. I navigated with GPS and compass. It was dark and night when I reached Skarvassbu. The mountain cabin was cold and I was a lonely visitor. When I wanted to get to sleep I heard a group on snowmobiles approaching. They entered the cabin and were surprised to encounter a visitor. A team of the Norwegian rescue service was making a night training session and the leader was immediately warning me for high avalanche danger these days due to the large amounts of snowfall of last days and the days to come. 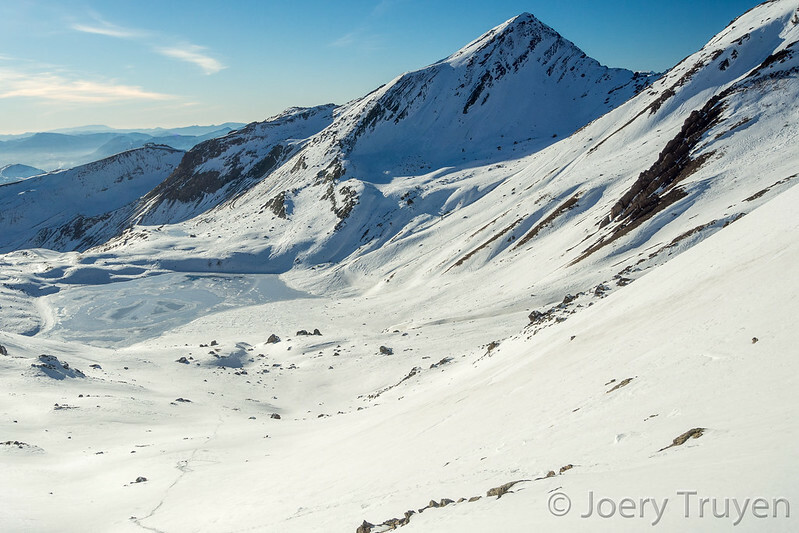 When I explained my plan to ski from Tromso to Alta, I didn’t receive much faith by the team. A few days earlier a group of people on snowmobiles died on the Finnmarksvidda plateau in a snowstorm, they told me as a next warning. I didn’t really succeed in explaining them that I wasn’t on my spurs. Probably they thought I was a fool as nobody seem to have undertaken such kind of a trip before in Northern Norway (so they told me). They left the cabin and continued their training trip through the dark of the night. The weather did not change during the night. Continuous heavy snowfall and snowdrifts were my part when I left in the white out during the morning. 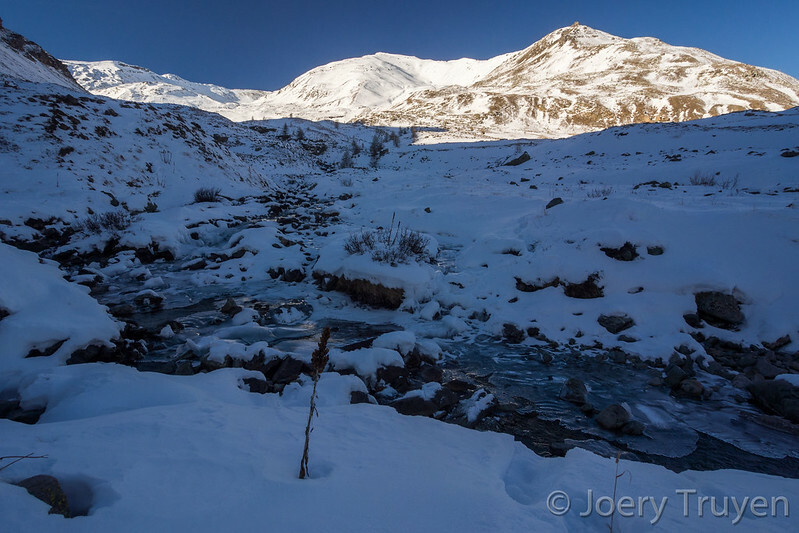 With temperatures not far below freezing the heavy powder asked lots of power to break a trail. 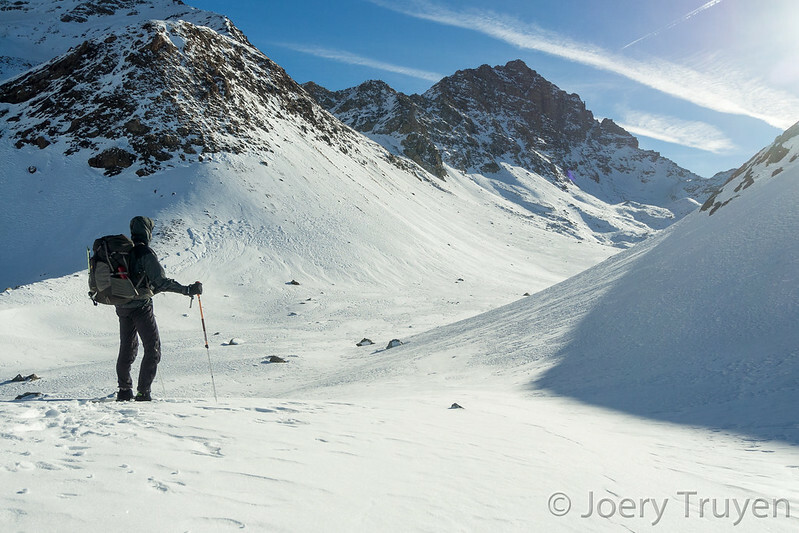 I couldn’t find any traces that marked a ski route anymore and so I skied by navigating with map and compass even though I didn’t always knew where I was exactly. Visibility became better during the afternoon and so I could easily find the Nonsbu cabin at the end of the day where I spent the next night. 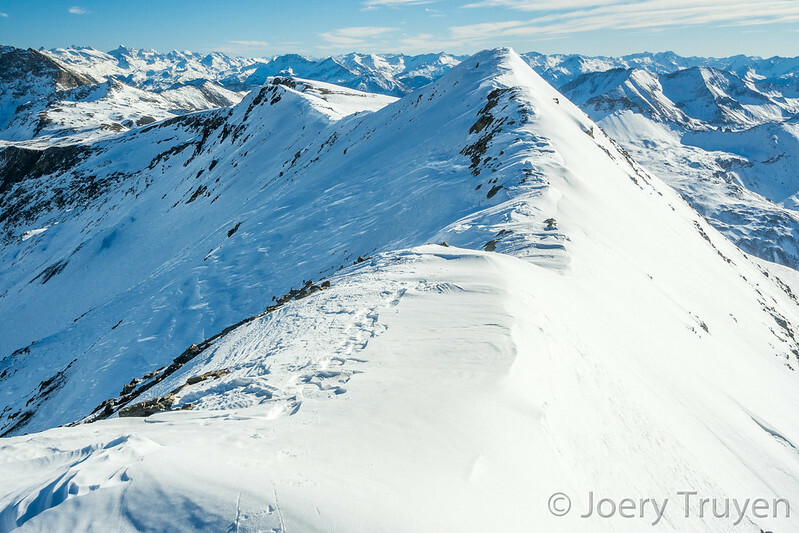 Skihytta in the Lyngen Alps above Lyngenfjord. 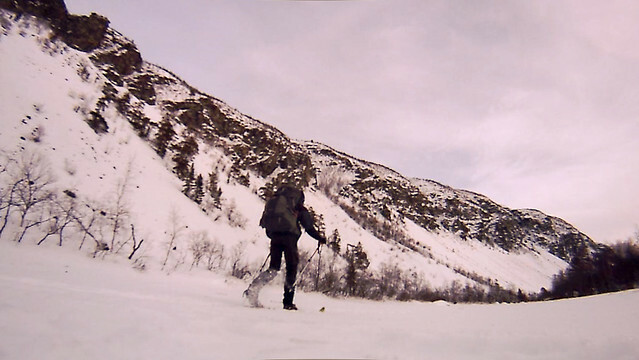 The next day I wanted to cross a mountain pass and descend towards Ullsfjord. Through heavy snowfall and a visibility of only a few meters, I managed to reach the wide mountain pass but then I got difficulties with finding the safe passage down the pass at the other side due to the white out. The first part descending the pass went over a wide inclined ledge which was the only spot where I could make a safe passage. Elsewhere I would probably trigger an avalanche. The track which I had saved on my GPS was not accurate enough to locate the start of the ledge. I waited for two hours until the visibility improved to about 50m, enough to find the safe passage end then descended the pass by kicking side steps. 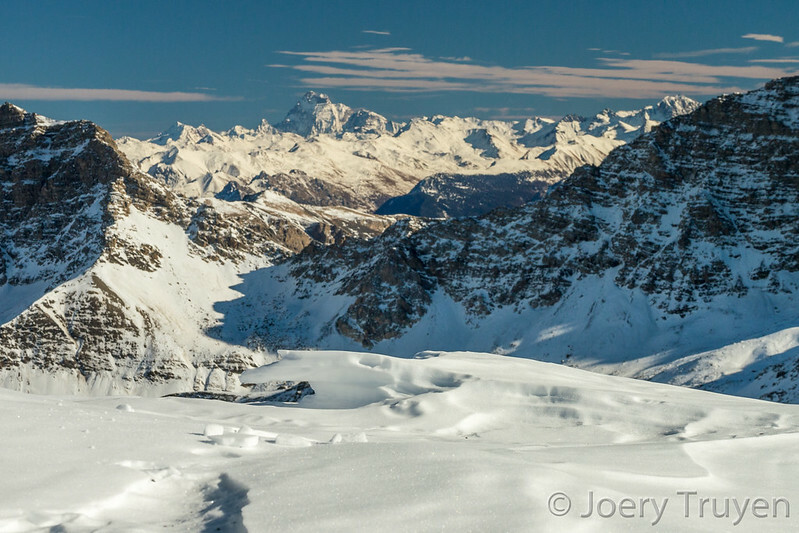 Looking back to Lyngen fjord from Olderdalen. 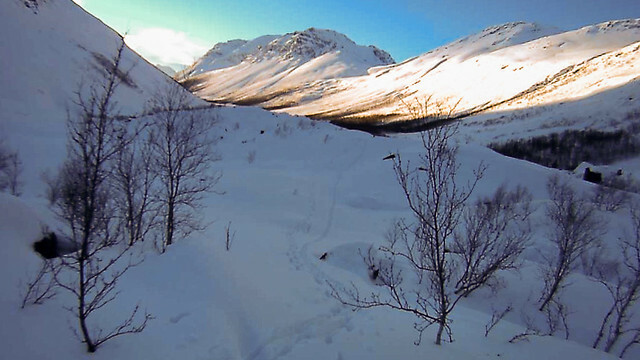 Further down I could maintain a fast speed till I reached the birch forest on the wide valley bottom of Breivikeidet. Temperatures were around freezing here and thick wet snowflakes fell from the sky, sticking in the branches and on my clothes. Moments later I stepped on the traffic road which led me to the fjord. However, a thick layer of half a meter of snow was lying on the road. No single car could drive here through the valley. When reaching the fjord, the conceivable turned out to be the truth. 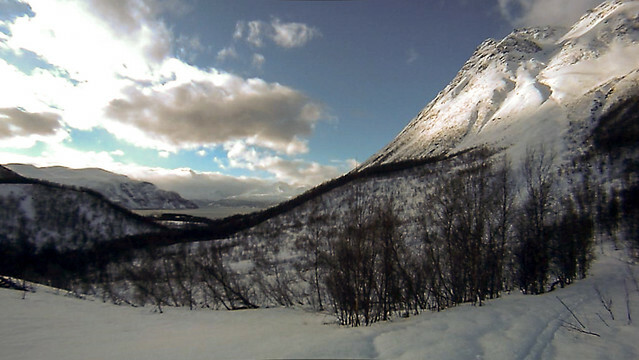 The ferry line was closed too, the Lyngen Alps at the opposite site of the fjord unreachable. 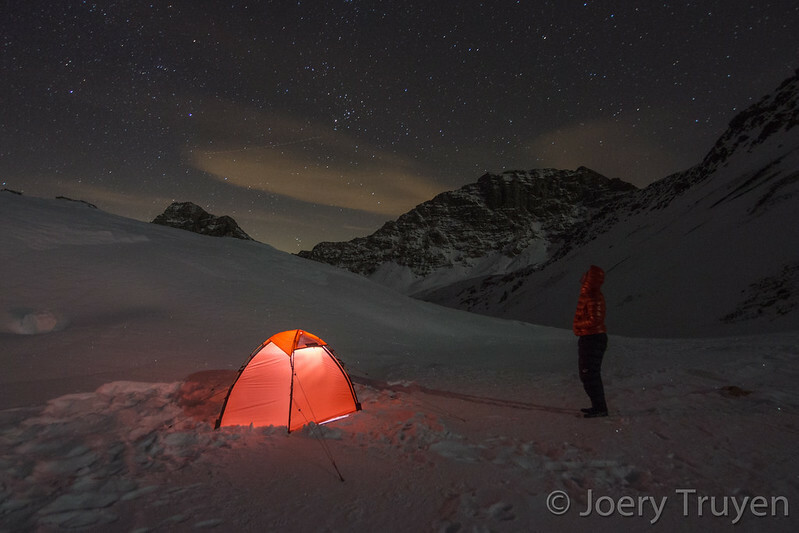 I pitched my tent in the snow on the shore and decided to wait for the day of tomorrow to search for a solution. The snowfall turned into rain during the night. 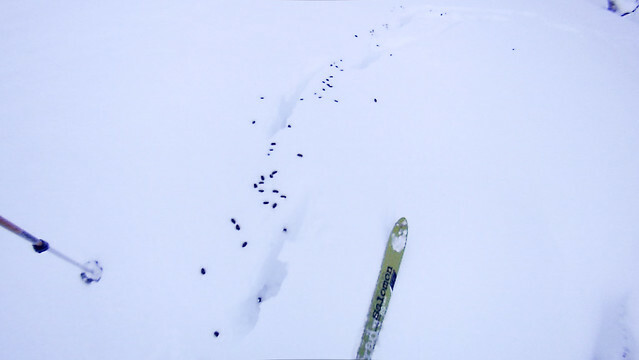 Following moose traces in Olderdalen. In the morning I found a phone number at the ferry quay and dialed the number on my cell phone. A man answered and I explained my situation. At first the guy was not helpful at all and he almost scolded me for being a fool because I was skiing through the mountains in this horrible weather and during such high avalanche risk. That was off coarse the reason behind the closure of the road and the ferry. After a while he could help me with searching the closest way to a bus connection which could drive me to the Lyngen Alps passed the fjords. 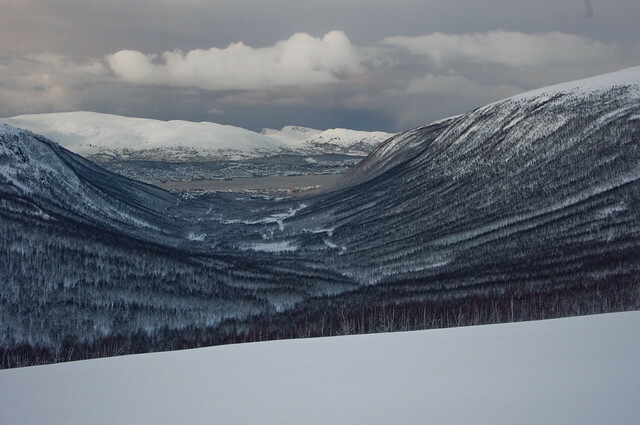 The solution was to ski back to the west for 20km through the Breivikeidet valley till the village of Fagernes and there catch the bus to Lyngseidet in the Lyngen Alps. And that was what I did. In the evening I arrived in Lyngseidet while the night had already fallen. 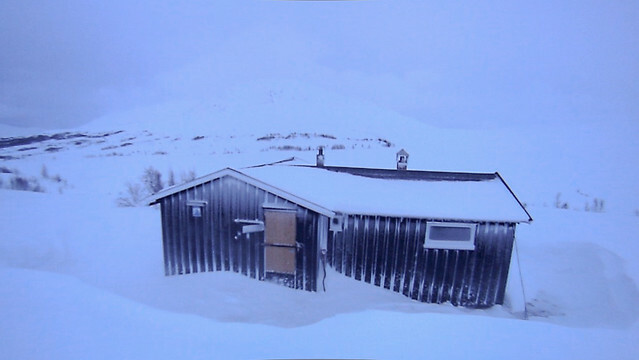 I immediately tethered my ski’s at the edge of the village and climbed to the Skihytta, a cabin placed at the tree line overlooking the Lyngenfjord. And so I spent another lonely night in a cabin. Day five of the trip became a tipping point. 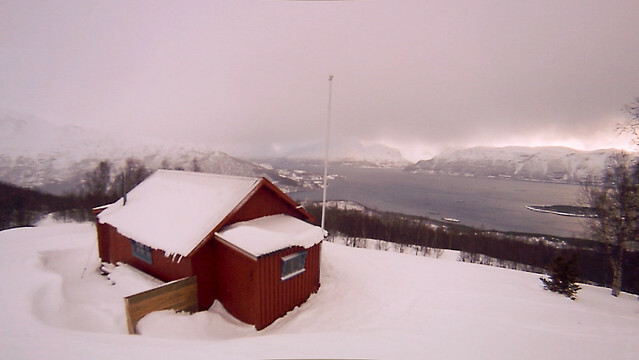 I skied back down to Lyngseidet during the morning, caught my food package at the post office and headed to the ferry over the Lyngenfjord which was not closed instead of the ferry over Ullsfjord. Bulldozers were pushing tons of dirty snow from the roads in the fjord. The weather had become dry now for the first time since it started snowing on the first day of the trip. While crossing the fjord on the ferry a modest sunray pierced through the clouds, the first sunray I saw during the trip. 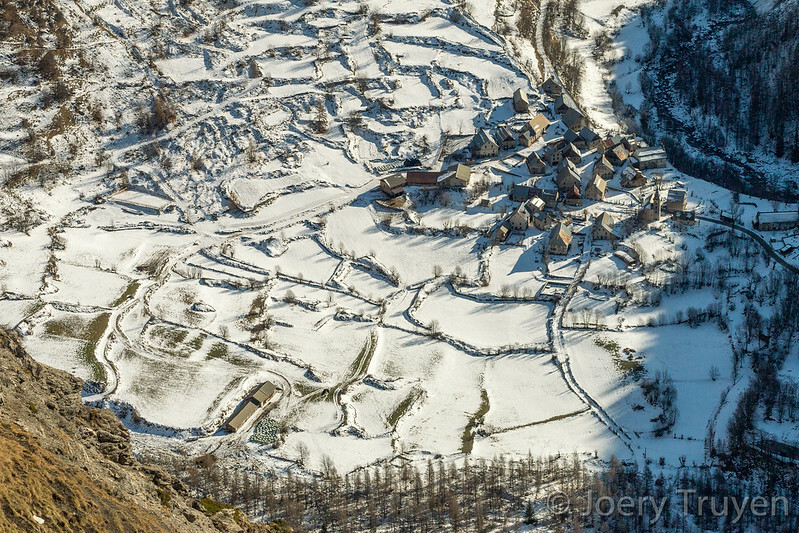 Arrived at Olderdalen, the small settlement at the mouth of the valley with the same name, I immediately left civilization behind my back and skied gently uphill through the Olderdalen valley. The sun appeared more and more between the clouds and I started enjoying the skiing. 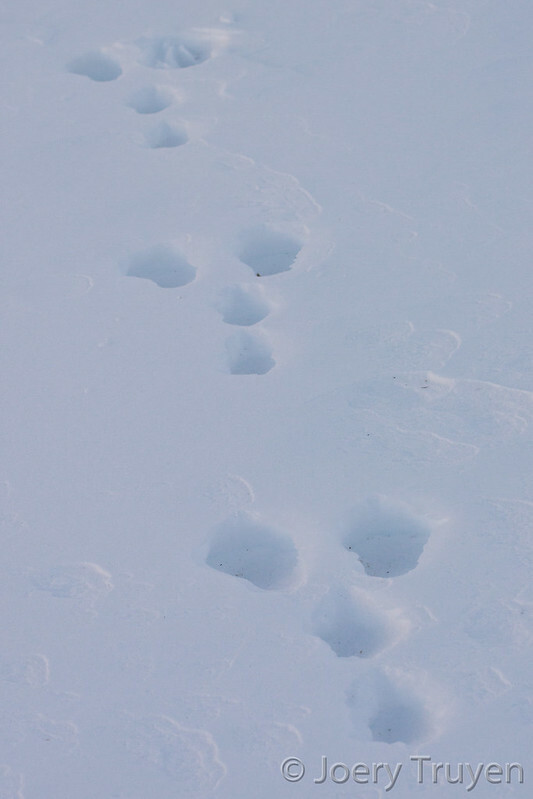 Deeper in the valley I encountered the footsteps of a moose which I supposed to have frightened away. I kept following the traces till I finally saw the moose climbing up the slope of the valley ahead of me above the lake Olderdalsvatnet. 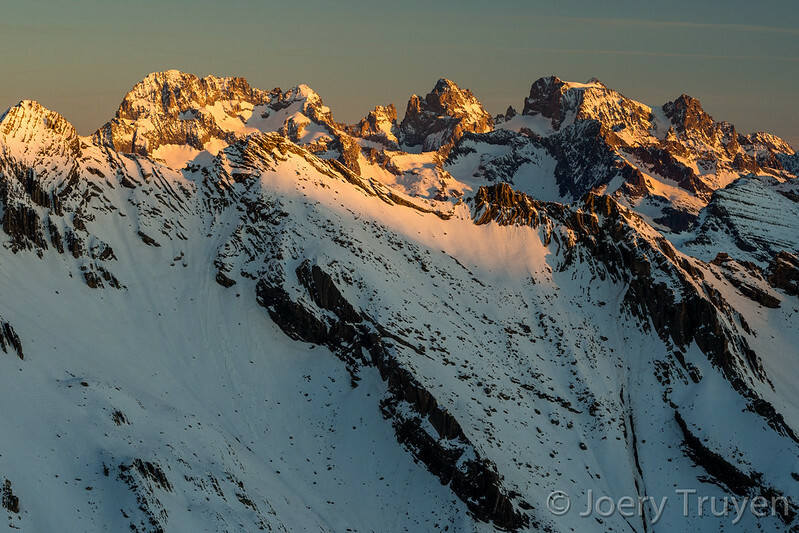 The moose, a cow, tried to reach a mountain pass in the valley ridge to get rid of me. 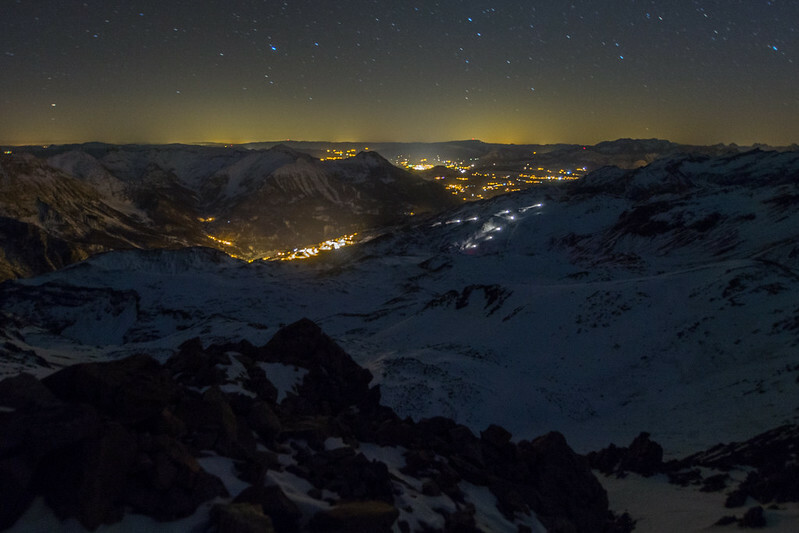 I continued through the valley and went on into the night. The sky became clear and the higher I climbed the colder it became. For some reason I wanted to keep going and reach the mountain pass at the head of the valley under Heargegaisa (1284m) mountain. 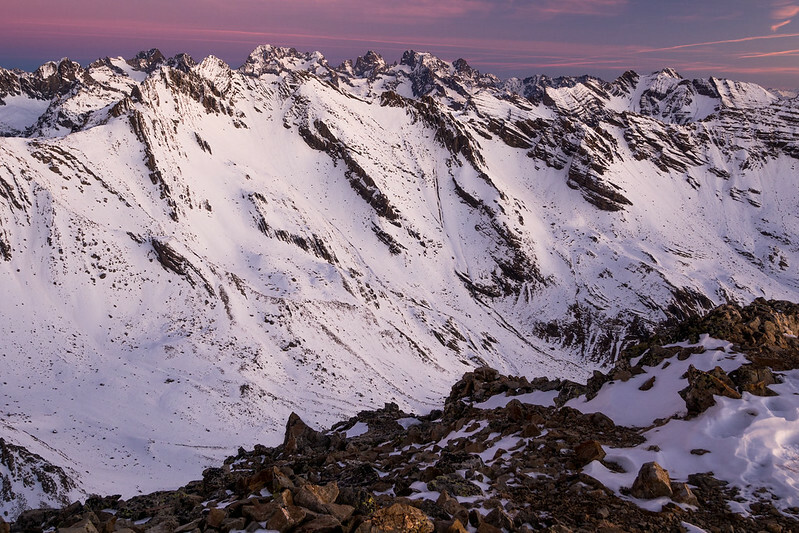 The mountain pass existed of a wide elevated plateau bounded by an abrupt abyss. There a fierce wind made the snow drift into my face. 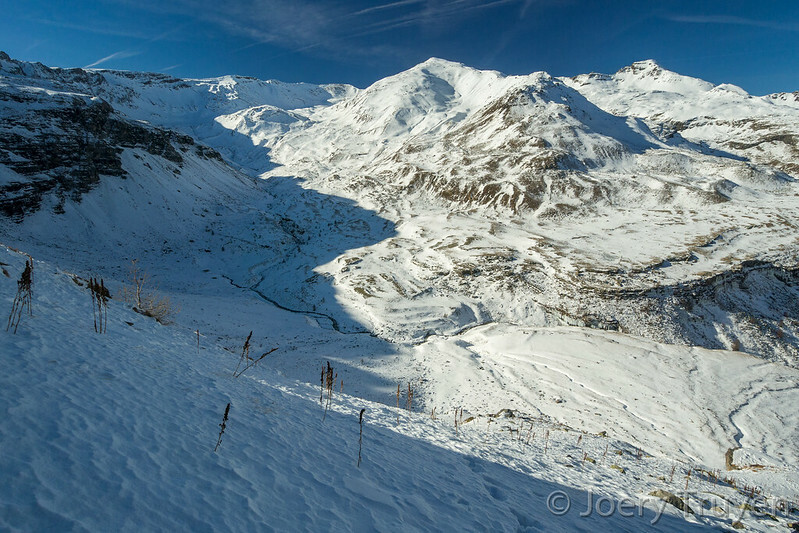 Finally I dug a snow hole in the mountain slope at the edge of the plateau. 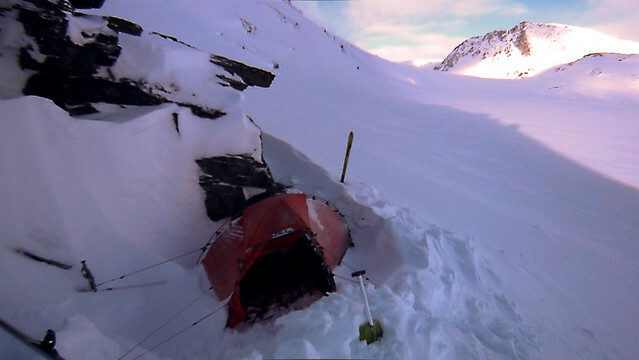 It was already deep in the night when I finally laid snug in my sleeping bag. At Olderdalsvatnet with the moose somewhere on the mountain slope (difficult to see with a fish-eye camera you know). 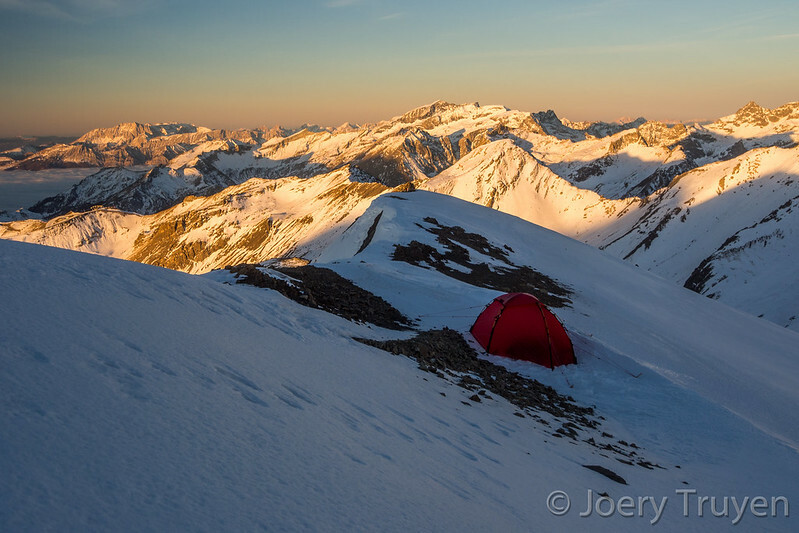 Coming out of the tent during the morning gave me a “wow” feeling. 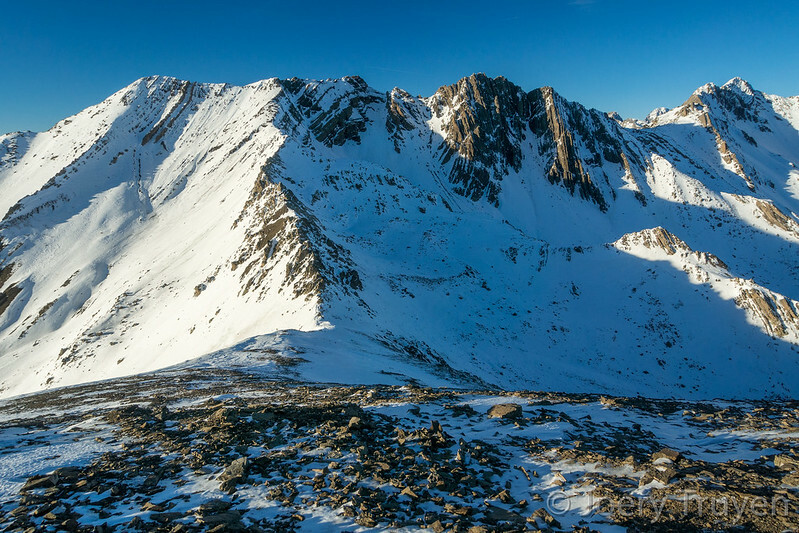 I had reached this place high up in the mountains by skiing through the night where I was not so aware of the surroundings and now the weather had became fair so I could admire a wild and desolate snowy mountain landscape I had never recognized the day before. Snow surface was hard and so skiing went effortless. I slipped through multiple valleys, crossed several gentle mountain passes which offered splendid views, encountered a few red foxes searching for snow hare, grouse or lemmings in the snow. By the end of the day I was not so far anymore from the Finnish border. I pitched the tent down a wide valley where a Sami family was camping in their teepees. The night offered the first aurora display. I remembered a vast wide curtain in colors from yellowish to green with from time to time nice moving undulations. And off course I was cursing my photo camera while watching the night sky. Myself somewhere in Olderdalen (and you can see my vapor barrier clothing by the way). 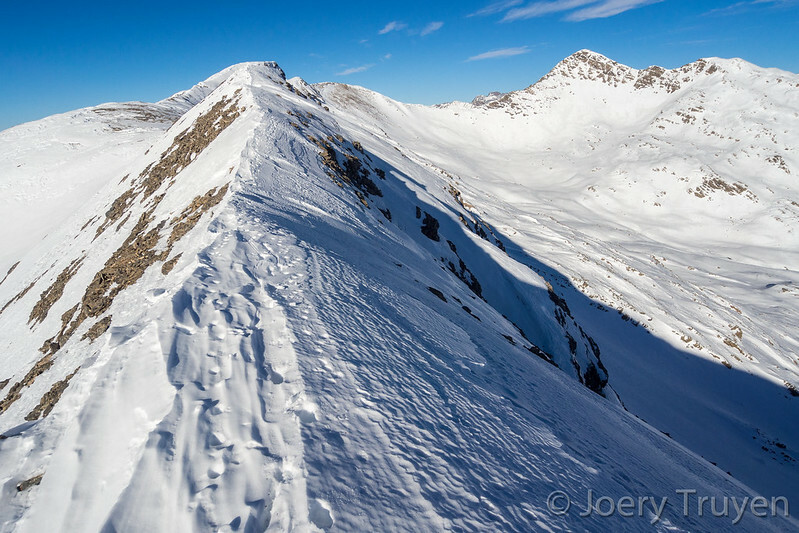 On day seven I skied eastward over rolling terrain while the snow surface became more and more icy, calling for caution. 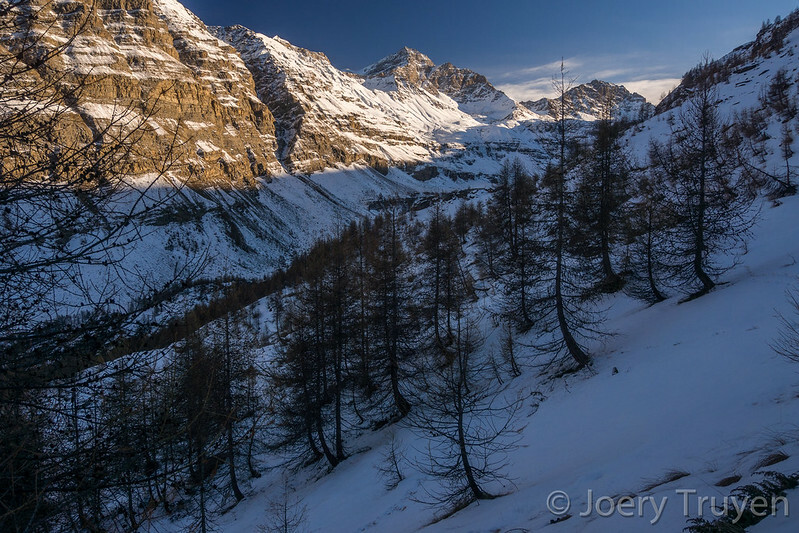 By the afternoon I reached the edge of the Reisadalen canyon where I searched a passage down into the valley. At the bottom of the canyon I skied upstream through the valley over hardened powder in the forest. The night fell and I continued under the stars which were later joined by a weak aurora display. 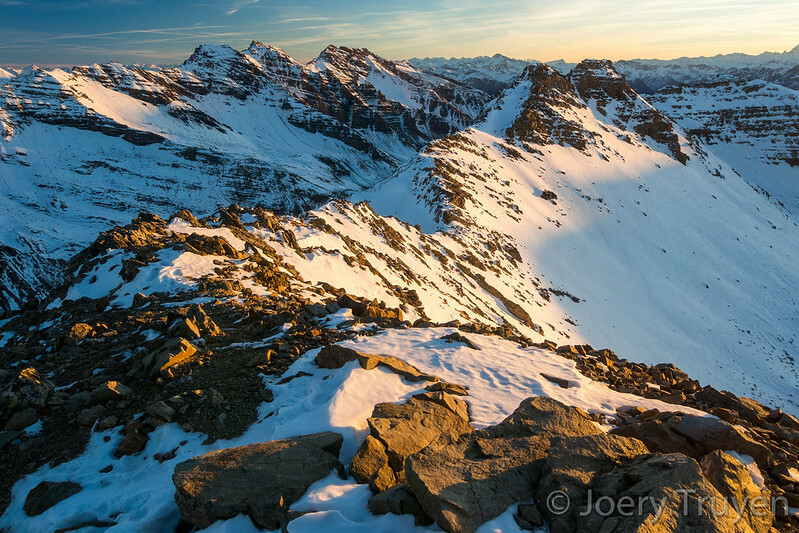 All this was one of the most powerful moments I’ve ever had on a winter trip. With headlight shining ahead, searching a passage through the forest during the night on skis with the northern lights glowing above the treetops is one of those amazing experiences which will forever remain engraved in my visual memory. 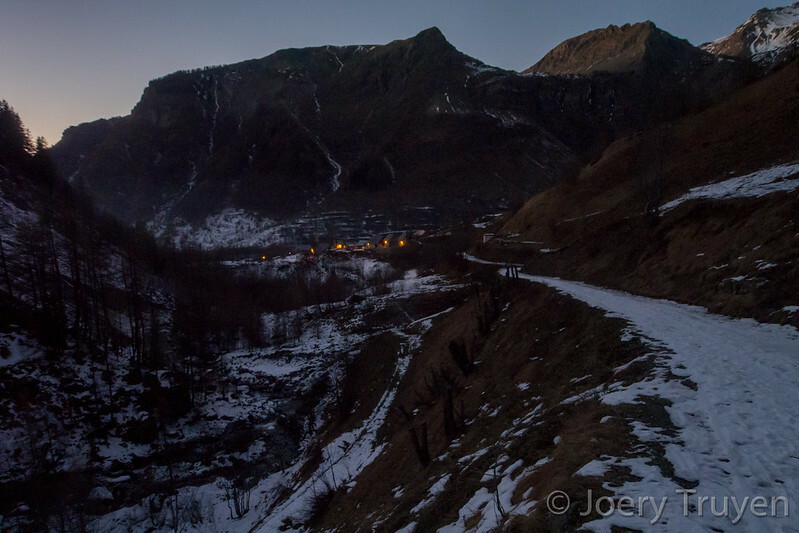 The night is falling in Olderdalen. 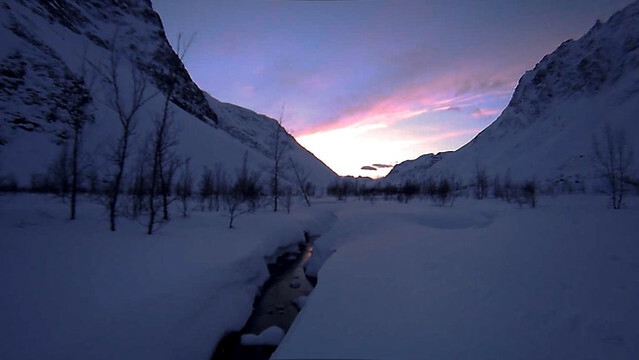 Deep into the night I reached the Sieimmahytta cabin by crossing the frozen river. Moose traces lay everywhere around the cabin. 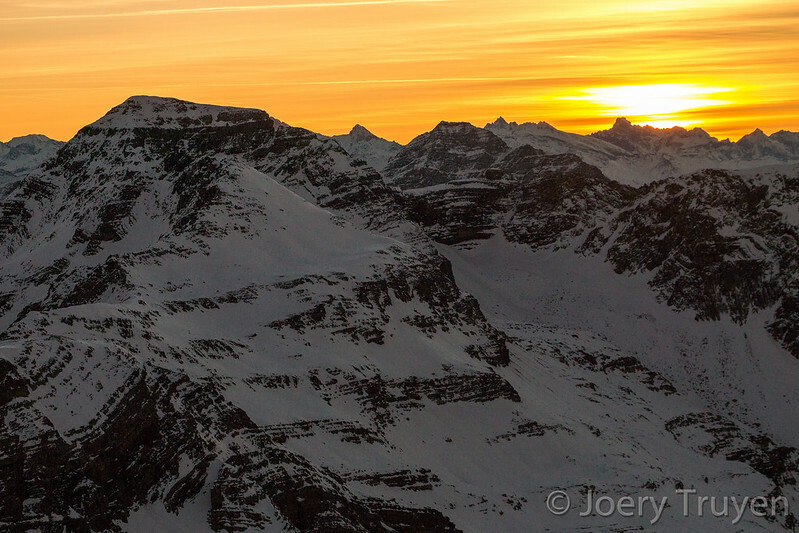 This day was the first day I had to cope with frozen ski bindings. I entered the cabin on my socks with my skis in my hands and the boots iced up in the bindings. I lit the wood stove inside and let the boots thaw out of the bindings. 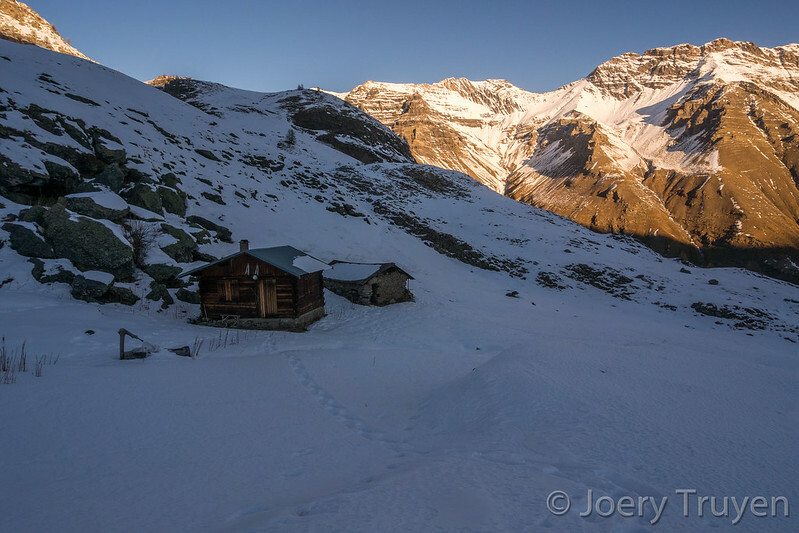 This cabin became the most enjoyable of the whole trip… and also the latest. Eating breakfast in the tent. 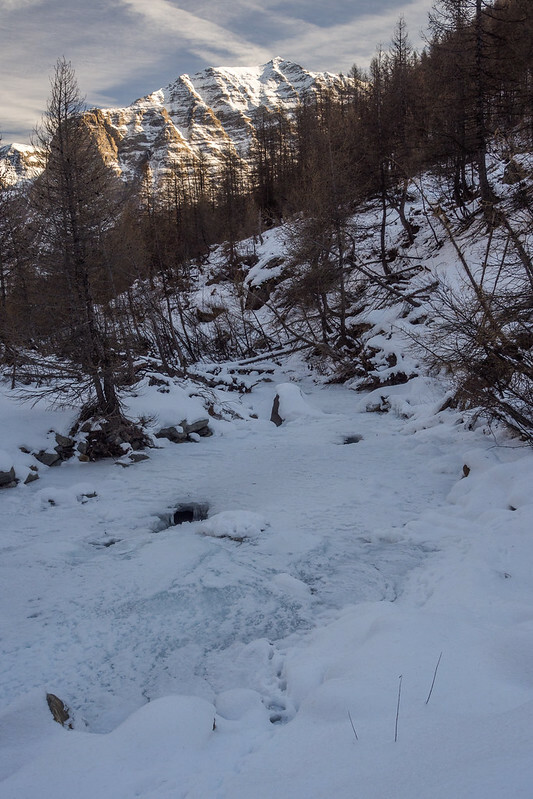 After the necessary nighttime sleep I continued over the frozen Reisa river the next day and passed under several frozen waterfalls which draped the cliffs of the canyon. 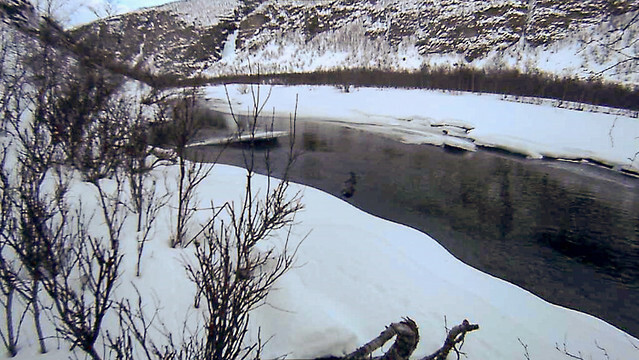 Further upstream more and more open areas appeared in the ice of the river and not many kicks further on my skis I had to leave the river bed as the river turned into a bed of fast flowing open water over most of its width. 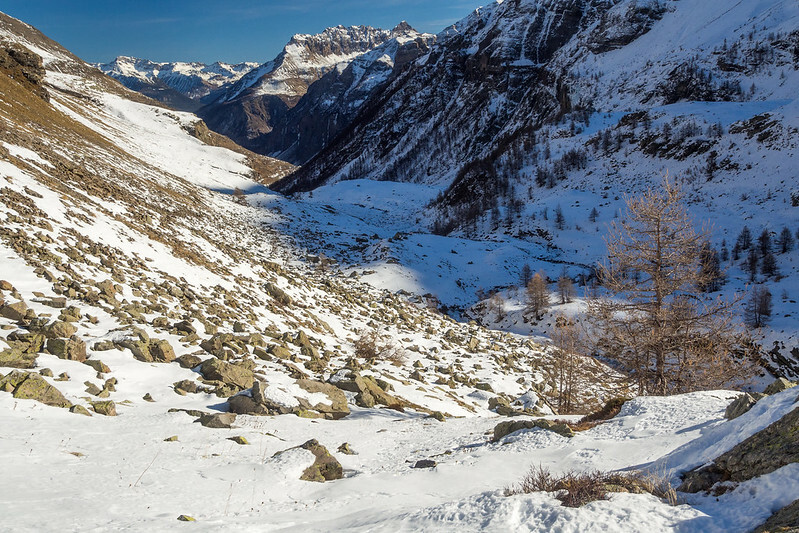 I followed the traces of a lonely skier through the forest on the riverside which seemed to have passed over here with a pulk two weeks before me I later learned when I read the inscriptions in the guestbook of the Naustihytta cabin. The guestbook confirmed me to probably be the second visitor only of the Reisadalen canyon this winter. 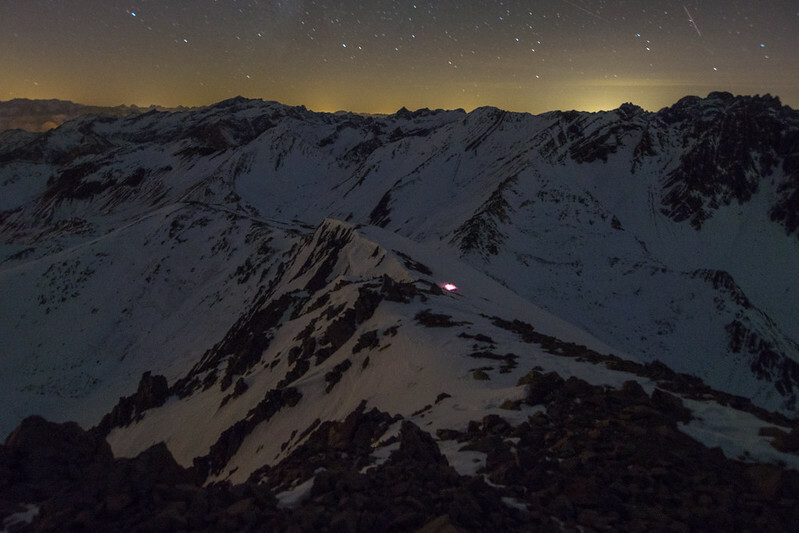 The bivouac spot under mountain Heargegaisa (1284m) in the Reisa mountains. Soon I could ski again over the river ice as the river became frozen again over its full bed. 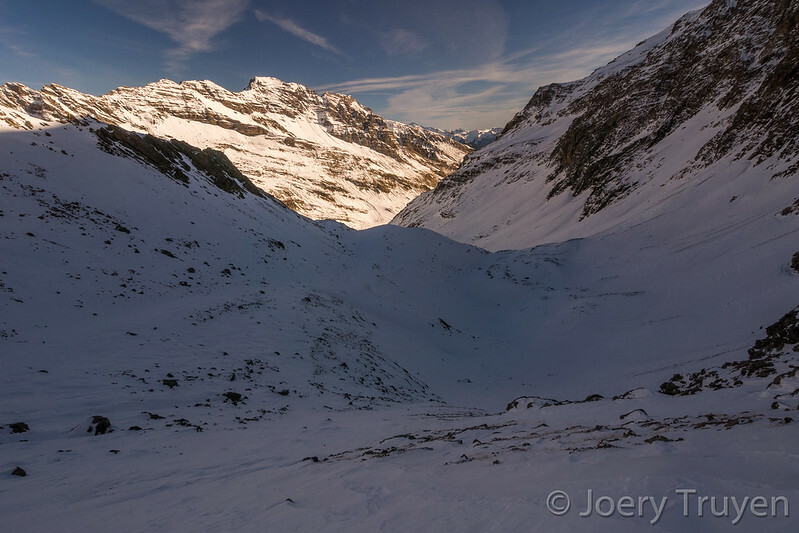 During the later afternoon I left the Reisadalen canyon by climbing towards the plateau through a narrow chasm. 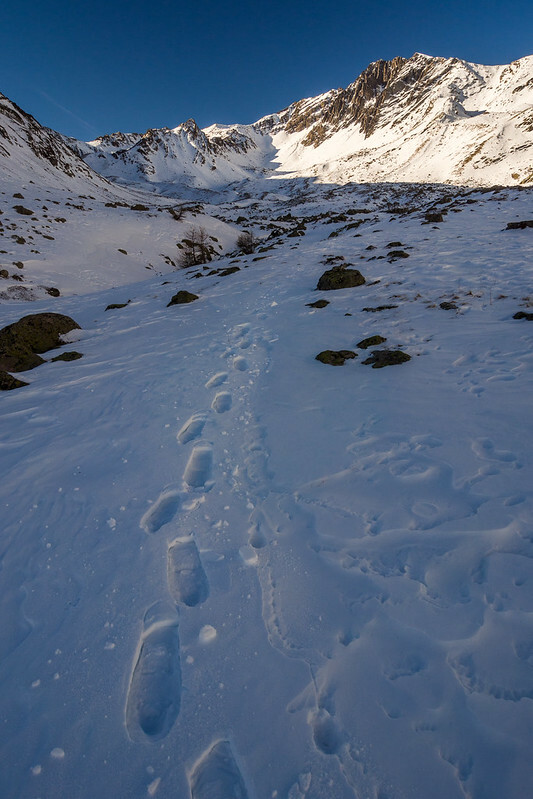 I continued over the plateau by following the markings of the Nordkalottleden summer trail which were now temporary visible above the snow surface from time to time. I now reached the extreme west part of the Finnmarksvidda plateau and gently climbed further uphill deeper on the plateau between the scattered birch and small spruces. Soon the skiing went less smoothly. 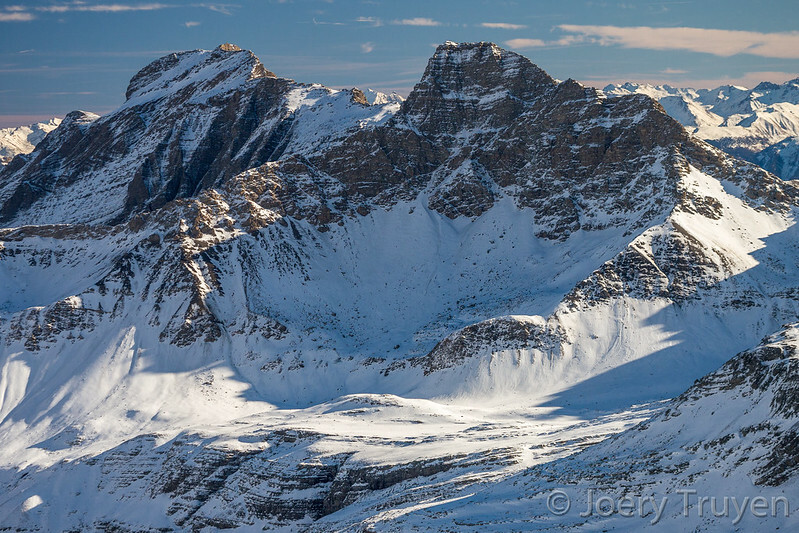 A breakable crust capped the powder snow and became harder and harder the more deeper onto the plateau. 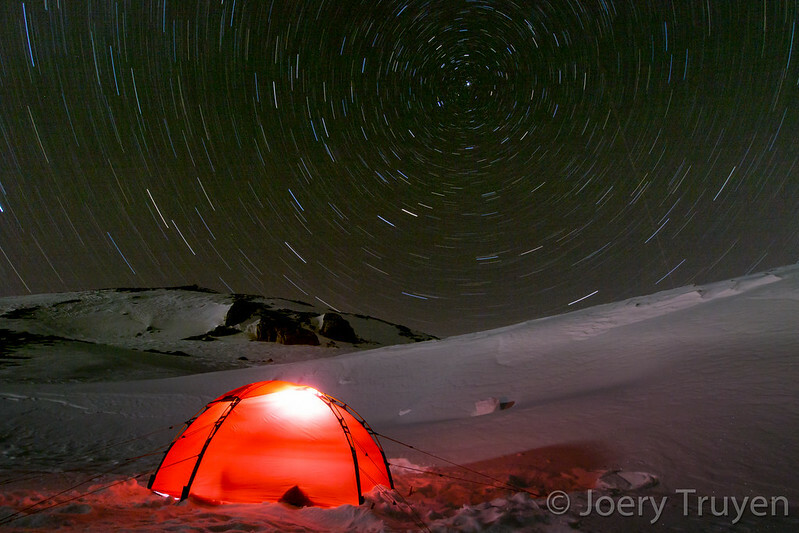 I called it a day around sunset, dug my tent into the snow and I crawled inside. 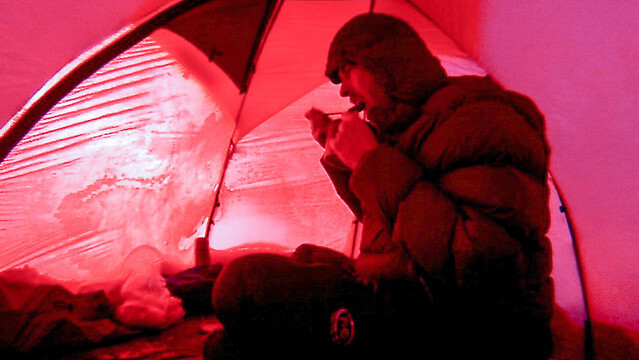 While eating dinner I could admire the third aurora display of the trip from inside the tent with the door wide opened. This one was now the most active one with quite fast undulations and some appearances of red colors in the light which I here saw now for the first time in my life. The view back while crossing a mountain pass in the Reisa mountains. The trip was becoming more and more troublesome tough. My ski bindings were frequently icing up even though I managed to get out of the bindings today by simply knocking my boots out. 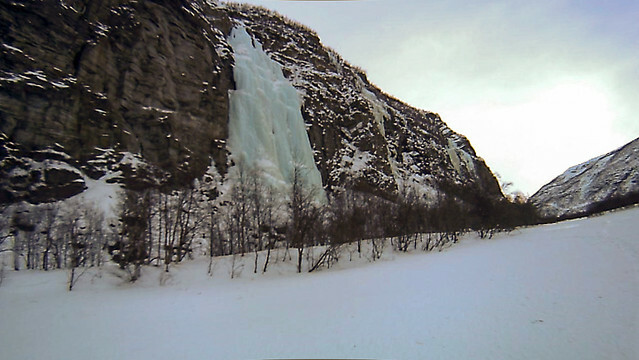 Frozen waterfall in the Reisa canyon. Day nine announced itself as the most tiring day of the trip. 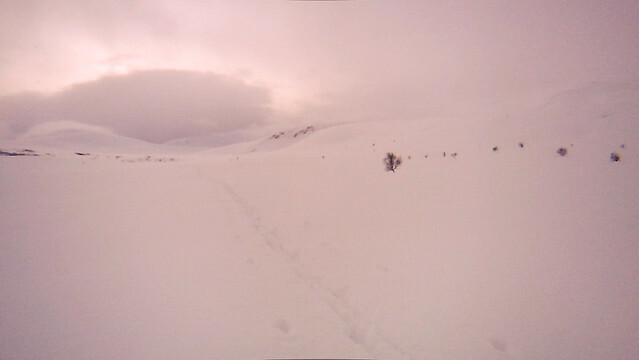 I continued with skiing eastward deeper onto the Finnmarksvidda plateau while snow conditions kept worsening. 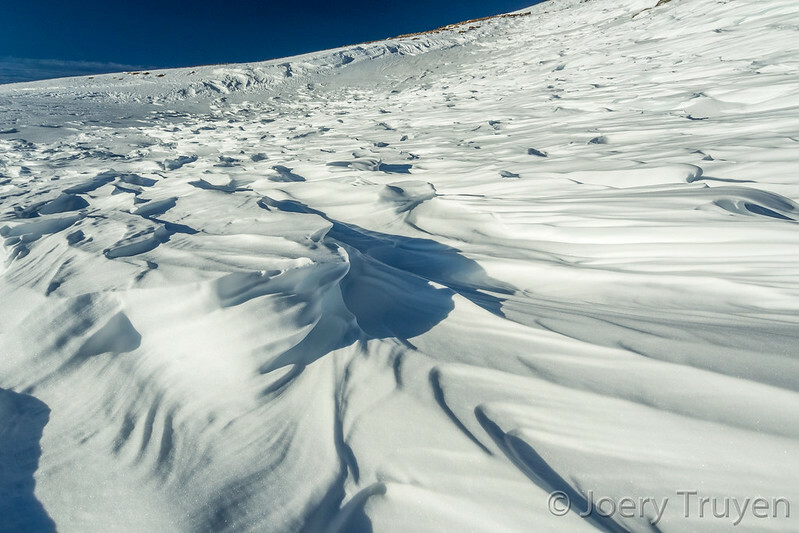 The snow crust on top of the powder became almost unbreakable while not able to carry my weight on my skis and so I continuously sank till my knees in the powder, pounding with my forward leg to break the crust with each step, a grueling activity to persevere for a whole day long. 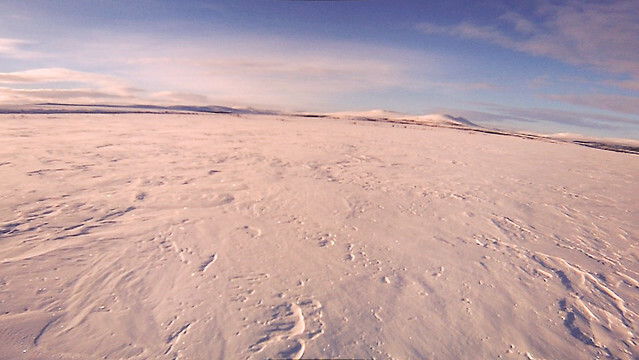 By late afternoon I reached the vast Raisjavri lake and encountered the Reisavannhytta, but unfortunately locked. The night announced itself to become very cold as it was almost sky clear, windless and the thermometer at the cabin already showed -21°c. 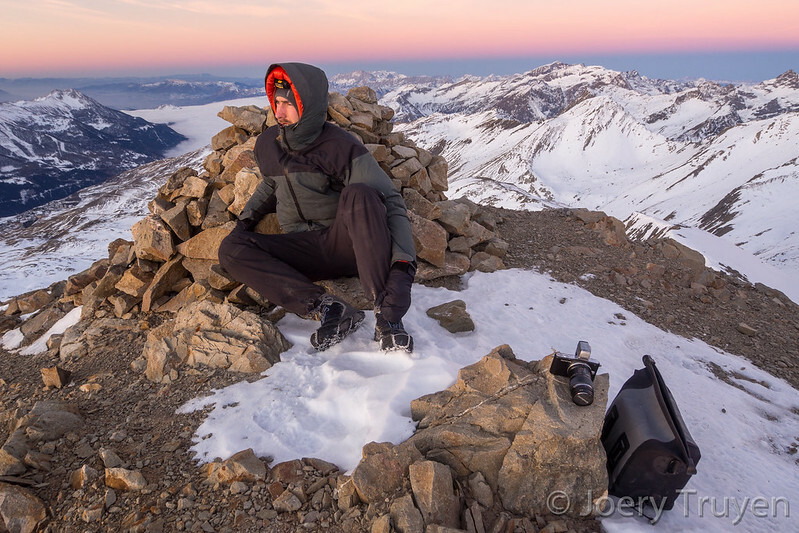 I searched for a spot to pitch the tent higher on the slope of a hill to get rid of the basins with trapped cold air on the plateau. My ski bindings were again iced up and now I couldn’t break them loose anymore myself. 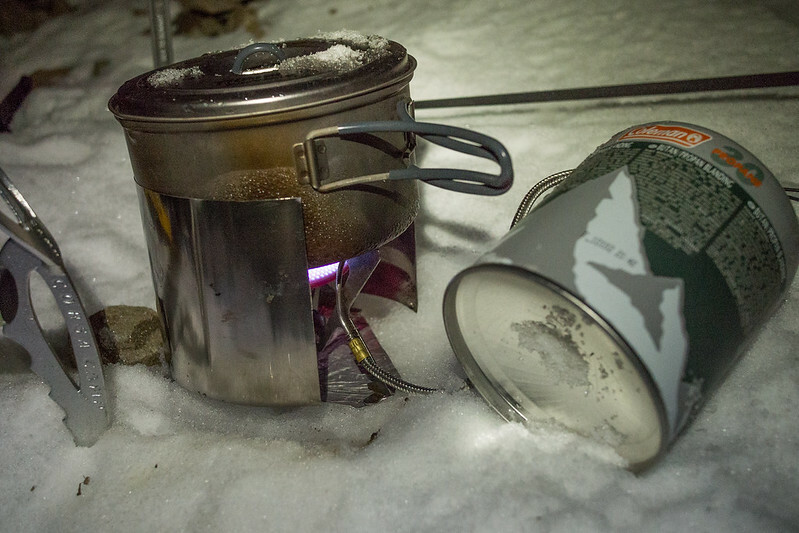 Melting snow and pouring hot water over the bindings was the only solution I had. 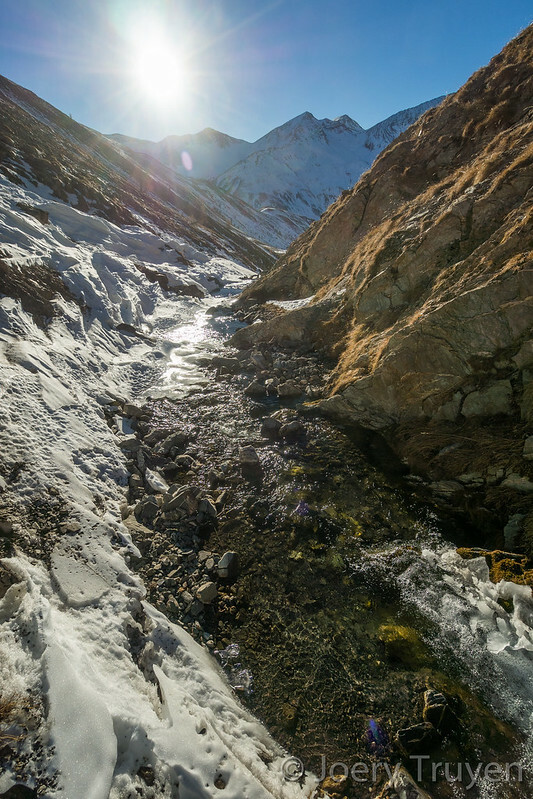 The Reisa river was not always frozen. Beside the binding problems two other problems had arisen today. My pants got torn in the crotch and I didn’t took needle and threat with me, neither some tape to fix it. Now it sounds laughable but I remember it as a serious discomfort at my balls whenever temperatures were very low or the wind blew. The third problem troubled me even more. A hole had appeared in the instep of both my ski boots, both about as big as a golf ball. Snow now easily entered my boots and so I couldn’t keep my feet warm and dry anymore. I much regretted that I did not take some roll of tape with me on this trip, a serious lesson I’ve learned here. With some tape I could have at least temporarily fixed the holes in my boots and the tear in my pants. 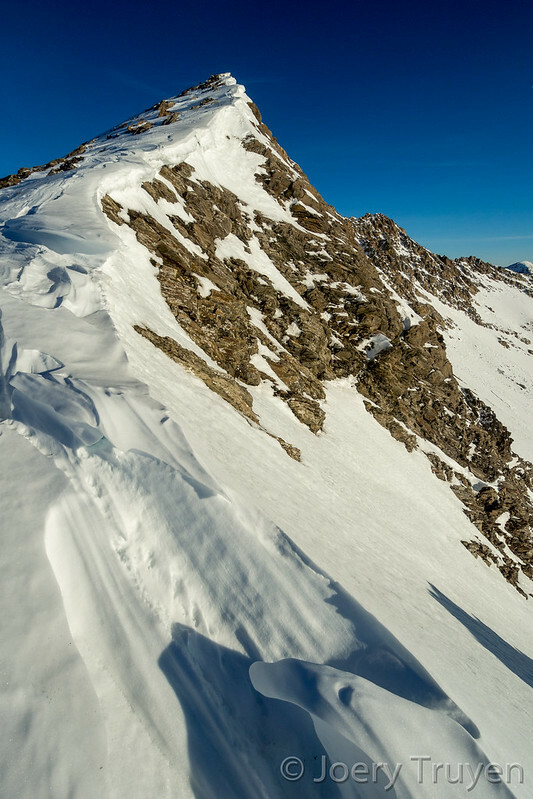 Skiing all the way to Alta at the coast, as was the initial plan, started to frighten me with these problems. Now the weather was fine, but would it stay like this for the next couple of days? 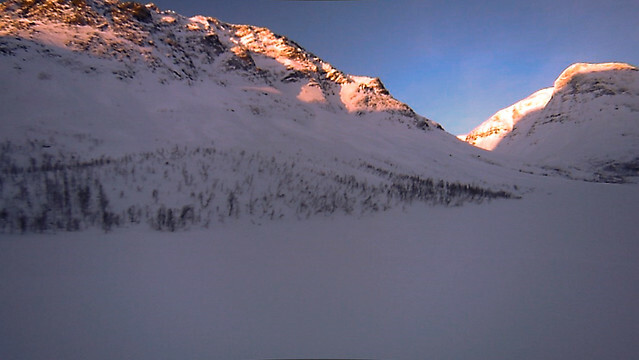 Skiing to Alta over the Finnmarksvidda, 92km to the northeast as the crow flies, would have taken at least three days to complete if at least snow conditions would not become worse than today. That evening I made the decision in my tent to ski to Kautokeino instead of Alta, 36km to the southeast, a distance which seemed bridgeable in only one long day. Even though the Sami village was far outside my map there was a small road connecting the town with the Biedjovaggi mines here at the surroundings of Raisjavri. This road, now probably a snowmobile track, would show me the way to Kautokeino. Skiing over Reisa river in the canyon. The next morning strong winds appeared, although the weather remained fine otherwise. I searched for the road and indeed encountered a clear snowmobile track. Navigating towards Kautokeino became handy this way. Exactly at sunset I reached the village and pitched the tent on a frozen lake just outside the village. 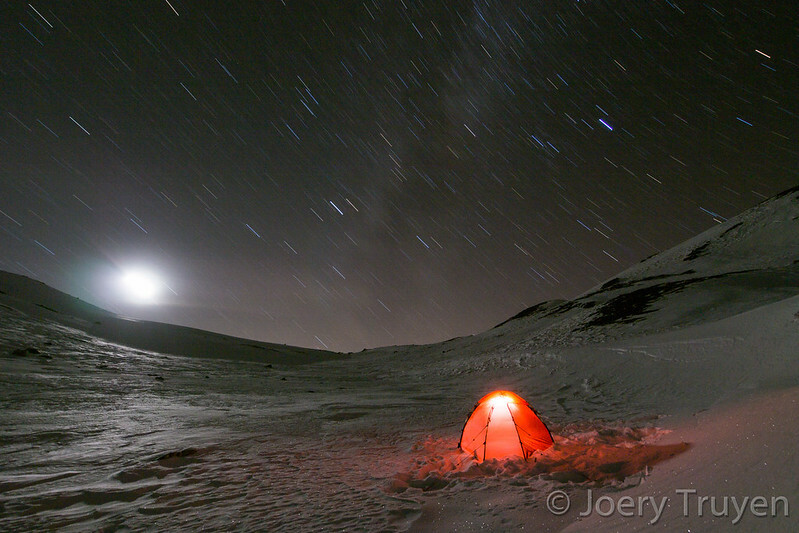 That night temperature dropped to -24°c inside the tent, the coldest of the trip. The trip now ended prematurely in Kautokeino. I spent a whole day in Kautokeino, took a bus to Alto the next day and amused myself with skiing in the groomed tracks in Alta for three more days. Despite the gear failures and the bad weather during the first half of the trip, I will keep remembering this trip as the most beautiful winter trip I’ve done so far even though the photos and movie shown here don’t reflect this feeling at all in my opinion. Failure of photo equipment, oh I hate it!